Wildflowers in the desert? Some of you may be scratching your head trying to picture this because a common perception of desert outside of Phoenix is that it is all sand and tumbleweeds. This picture is far from reality. In the Spring, the desert can be covered with yellow, purple, and orange from wildflower blooms. It’s common to see poppies, brittle bush, owl clover, larkspur and lupins in bloom in the deserts surrounding Phoenix. Additionally, with the wet winter this year, this is the best showing of wildflowers in the last 10 years. This pop of color makes an already great hike, spectacular. Here are a few of our favorite wildflower hikes in the area. Most hikes have little elevation gain which make for nice beginner hikes as well. The Granite Mountain Loop is a fun trail in the lesser used northern section of the preserve and happens to be one of the best places in the preserve to see wild flowers in bloom. There isn’t much elevation change on this hike which makes it nice for beginners as well. Distance 5.1 miles, Elevation Change – 400 feet. Like the Bajada Trail, this wildflower hike is also within Phoenix city limits. This part of the Phoenix Mountain Preserve is just to the east of Piestewa Peak and sees far less foot traffic than the peak trails. The trail passes through a valley created by the Piestewa Peak and Quartz Ridge that makes you forget you are in the middle of the city. Start at the 40th Street Trailhead just south of Shea Boulevard for this hike. Distance – 4.7 miles, Elevation Change – 620 feet. 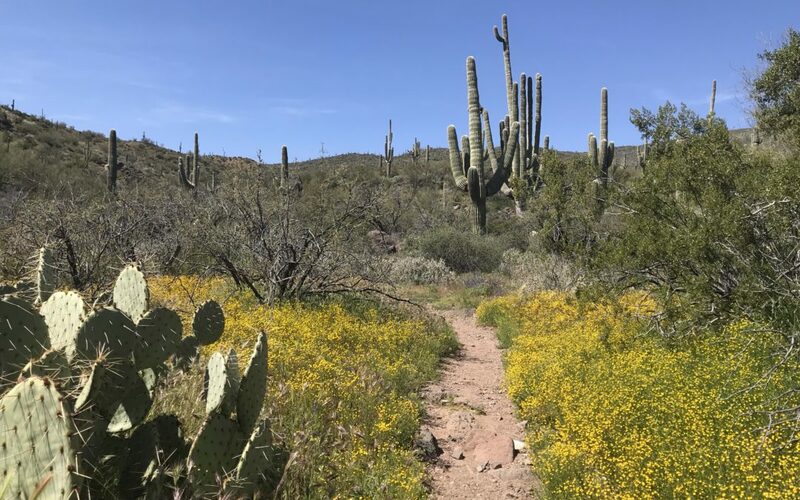 Just to the north of Phoenix, this 7 mile loop in the Cave Creek area not only has an abundance of wildflowers to see in the Spring, but also has outstanding views and a large concentration of giant saguaro cacti. This particular loop is moderate in difficulty but there are other less strenuous options in the Spur Cross area to view flowers as well. Distance – 7 miles, Elevation Change – 1,335 feet. This trail just to the east of the Phoenix metro area, wanders through the desert below the towering Superstition Mountain. Also known at the Jacob’s Crosscut Trail, this out and back hike is a great way to enjoy the color of the Sonoran desert landscape. Distance – 4.8 miles , Elevation Change – 790 feet.